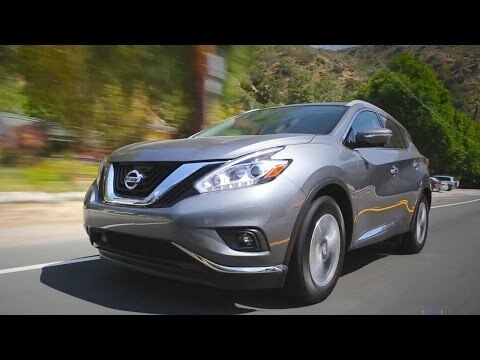 Nissan describes the 2016 Murano as a "social lounge" and who are we to disagree? This is not, exactly, a family SUV, but aimed more at style-conscious adults looking for supple comfort, quiet refinement, a full complement of features, driving ease, assured capability, peace of mind and all at a reasonable price. Amazing look, feel and safety features! I love my Nissan Murano! The body style is modern and eye catching, the inside is comfortable and the safety features are great! I love that it has both front and back cameras so that I can easily see everything both in front and in back of my car. I use the front camera every time I park so that I can park directly in the middle of the parking space lines. The car also beeps at you if your backing up and someone or something all of a sudden is behind you. The car also beeps at you if you have your turn signal on and someone is in your blind spot. Noises can bother me but this beeping does not bother me at all! I love this car and would definitely recommend it to anyone! Nissan Murano is one of the great cars you can purchased. The performance is great. Easy to use and very comfortable. The space is good for a family or just couple. The interior design as well as exterior is very simple yet elegant to look. Its very easy to use and manipulate. The feature of the car is also nice, with individual lights for each passengers and air conditioned provided at the back. The trunk is also spacious. This car is very useful whether you go for casual driving, or trail driving. Awesome mom car for the not so average mom! My vehicle is amazing. It handles well in all types of weather. I have two children and still find that there is room in my car. I have had a variety of different vehicles but this type is by far my favorite. I love the sleek look, sporty accessories, sweet interior design. I feel young, fast, stylish and safe. I can always count on my car and that really matters. If I ever get a new car it will be the same kind. Nissan North America, Inc. (Nissan) is recalling certain model year 2016 Murano vehicles manufactured December 17, 2015, to February 11, 2016, and 2016 Maxima vehicles manufactured November 25, 2015, to February 12, 2016 and equipped with an antilock braking system (ABS) and Vehicle Dynamic Control (VDC). The ABS actuator may have a damaged O-ring that may result in a lack of brake fluid pressure. Insufficient brake fluid pressure may lengthen the distance needed to stop the vehicle, increasing the risk of a crash. Nissan will notify owners, and dealers will inspect and replace the ABS actuator, as necessary, free of charge. The recall began on May 16, 2016. Owners may contact Nissan customer service at 1-800-647-7261.